1. Strawberries and Cream Cake. 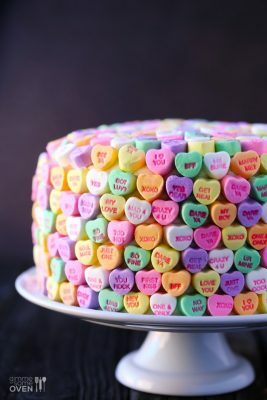 We “heart” this delicious dessert idea from Gimme Some Oven. You can make the cake from scratch, or just use their decorating idea. Either way, call us when it’s ready! 3. Conversation Heart Wreath. Wreaths aren’t just for Christmas anymore – people make or buy them now for every occasion. This pretty wreath, from Darcy Maynard, can be made with a foam heart. We found them at Jo-Ann Fabric for only $5.49 (or $6.99 on Amazon if you don’t want to leave the house). 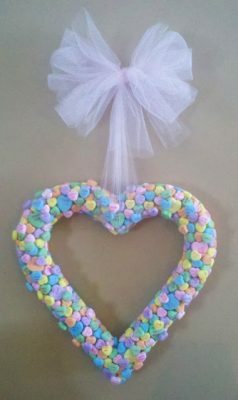 Attach the candy hearts with a hot glue gun and use some tulle for the perfect finishing touch. 4. Conversation Heart Picture Frame. Give your loved one a framed picture of the two of you in a handmade frame. This idea, from CraftyMinx, is easy to make. 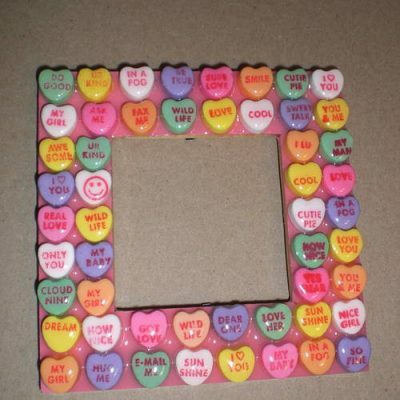 Simply repurpose an old frame by painting it, glueing on the candy heart, then covering with resin. 5. 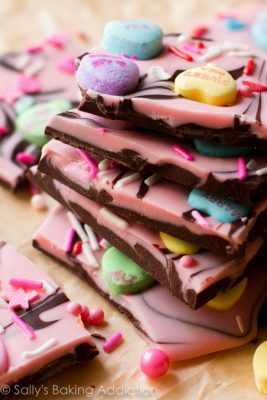 Sweetheart Swirl Bark. How about some sweets for your Sweet? This recipe, from Sally’s Baking Addiction, is “super simple.” Says Sally, “All we’re really doing is combining semi-sweet chocolate and white chocolate. We’ll add some pink candy melts to the white chocolate to create that cotton candy pink shade. We’ll swirl it, we’ll top it, we’ll eat it with our sweethearts. And if your sweetheart is a bottle of wine, more power to ya.” Love it! 6. 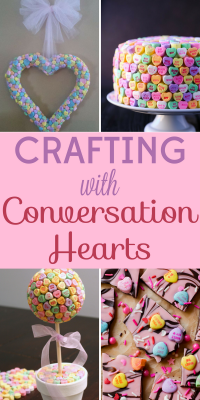 Conversation Heart Candle Centerpiece. According to the Parent Society blog, “This project only takes three materials and about two seconds to do — my kind of crafting! 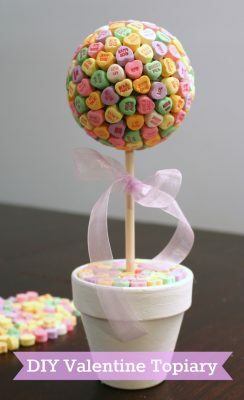 Whether you’re hosting a Valentine’s Day party, or just need a simple centerpiece idea, this is an easy craft to make. 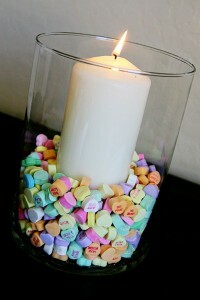 Try different shapes of hurricane candle holders, and cluster them together for a fun look.” What you need: a bag of conversation hearts, a pillar candle and a glass cylinder hurricane candle holder – all items you can find at the dollar store.